Great Days…Tuff Days….Guess That’s Fishing! Looks like more normal weather pattern is here. 90s tomorow and Wednesday with Thursday and Friday in the upper uo and a 50% change of rain. The weekend has low to mid 90s and again, changes of rain. A little more on Saturday with Sunday and Monday in the 40% range. Generation schedule continues to be no generation in the a.m. and something, usually 1-2 units, coming on at noon t0 1:00 p.m. and ramping up to 3-4 shortly thereafter. Low generation over the weekend, about one unit, for 4 hours or so. Today, they fired up all four at noon! Lots of water! The projection for tomorrow is a low one unit until noon, then a low two for an hour, full two for an hour then three units for four hours. Should have it back to a low one unit by 10:00 p.m. or so. Thursday. Carolyn took Michael and Kirk out for half a day. They fished with Stan on Wednesday, but he had a trip scheduled with Bob from Michigan on Thursday, so the drew Carolyn for their second day. Miserable day Wednesday as they had high water and lots of rain Wednesday. These guys are both new to fly fishing so Thursday, they went through the paces. Lots of casting and fast mending as we fished the rise (two generators came on around 11:00 a.m.) with the red San Juan worm dropped from the big ruby. We caught a few earlier in the morning with the black copperhead midge, but the action was the water rise. Stan and Bob were out for the morning. Good day for Bob on the black copperhead midge, then a size 20 black soft hackle. This was especially fun for him as he was breaking in his new 10 foot, 4 weight Access rod! They finished up the day with an olive wooly bugger. Nick, from South Carolina fished with Jim. CQ, copperhead black midge and blood worm dropper were their patterns for the day. Soft takes and tuff to keep the fish on the hook! Saturday, Mike and his daughter, Amanda fished with Stan. They are owners/operators of Lakeshore Resort. Great day on the copper dun and P&P midges. 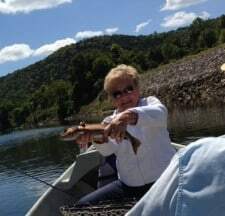 Carolyn went fishing with Dawn from Louisiana. We had a fun day stripping the holographic green crackleback in the shallows. Lots of learning for Don and Larry from Kansas. They spent half a day with Jim. Both came back to the shop babbling. CQ streamer, black zebra midge and blood worm dropper. Fun and fishy day for these guys. Stan had John and his son, Joel out for most of the day. These good fly flingers had a great day on the black zebra midge early, then the P&P. Think John is coming back in September! This entry was posted on Monday, August 4th, 2014 at 9:46 pm	and is filed under Fishing Reports. You can follow any responses to this entry through the RSS 2.0 feed. You can leave a response, or trackback from your own site.